This weekend the entertainment industry has suffered a major lost. Clarence Clemons, who has worked with Bruce Springsteen for four decades as a part of the E Street Band passed away Saturday June 18th. 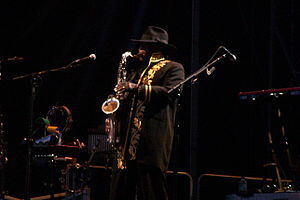 Clarence was an amazing saxophone player(which is one of my favorite musical instruments). He has not only worked with some of the industry’s major artists, but has also made many t.v and film appearances. Clarence was hospitalized last week because of a serious stroke and due to complications of the stroke, the industry lost a great one. Many artists including Lady Gaga took to the social media world to address this lost. Our condolences are with his family as they cope with their loss. This entry was posted in Music and tagged Big Man: Real Life & Tall Tales, BruceSpringsteen, clarenceclemons, E Street Band. Bookmark the permalink.